Example: if a child jumps in front of the car, does the car swerve and possibly kill the passengers or run over the kid? [The real issue though] is whether driver error causes more deaths in these cases. Maybe the AI is able to more efficiently brake in time, etc. The problem is that, when speaking of driverless cars, the whole “trolley problem” approach consists, in a very non-negligible part, of barking up the wrong tree. What is THE BEST WAY to not have cars running over kids? Deal with that problem, and the “trolley problem” form of the “enormous moral issues AI cannot understand” practically disappear. We have been successfully using subways and trains for more than 150 years now, without any need for AI, thanks to physical separation between the paths of pedestrians and (shared!) wagons. Rebuilding cities in that way today would make them better places to live. That is a priority, and a very urgent one in an age of accelerating urbanization. 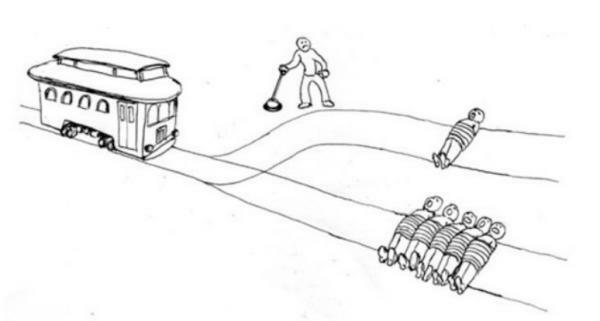 The fact that tackling that problem first would also make the trolley problem disappear is just a welcome, overdue side effect. …just rising good old fences to the sides of each road, so that pedestrians can only cross the road in certain points. Doing that may very well be much more effective and much cheaper, not to mention totally free of countless privacy, security and surveillance issues, than building the huge infrastructure needed to make any Artificial Intelligence avoid any “trolley problem” in the real world. “Continues” here. « Coming soon in some EU state: Bad copyright vs Privacy?